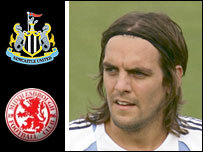 Middlesbrough are set to win the race to sign Real Madrid defender Jonathan Woodgate on a season-long loan. The 26-year-old is expected to undergo a medical at Boro on Wednesday before completing a move to his hometown club ahead of Thursday's transfer deadline. Middlesbrough boss Gareth Southgate said on Monday: "We've had a chat with him and he wants time to think about what he wants to do." Newcastle have been linked with their former player but have not commented. Boro's defensive problems were highlighted as they slumped to a 4-0 home defeat by Portsmouth, prompting Southgate to quip: "Hopefully he hasn't had the television on while he's thinking about it." "But we should know something within the next 24 hours." Bolton and Newcastle are also reported to be interested in signing £5m-rated defender Robert Huth from Chelsea. Woodgate is looking at a season in English football to get his Real career back on track after it was knocked off the rails by a succession of injury problems. The England defender signed for Real in a £13.4m deal in August 2004, but has played just 14 games in two years. His chances of regular first-team football at the Bernabeu have been reduced by the arrival of new Real coach Fabio Capello and Italy's World Cup-winning captain Fabio Cannavaro.